I have been requested to write some of my experiences of my early days in the southern part of Aitkin County, so I will do the best I can. I never had the time after I landed in the United States to attend school as life's demands became too pressing, but I went to work in an entirely "New England Yankee" community in central Minnesota the first year I was here, which was 1882. In the two years I was among them I got a good insight of American life and background, something that few "newcomers" get when they stay among their own people. I was born the fifth of April in 1864 on the old Einstabøvoll farm, Valestrand, Sogn Parish, Sunnhordaland, about fifty miles south of Bergen, Norway. Father was a sailor and fisherman and the first implement I remember handling was an oar. I, as a mere boy, started to go with Father to handle the lobster traps, and to go after cod, herring and halibut as the seasons changed. Both my father and mother had good educations for their time, so they kept me at my books, and I could read quite fluently at the age of seven. Some of my uncles were scholarly men, and they sent me fine reading material which I read with great interest as they came. Father who in his younger days had sailed the seven seas with both Norwegian and English ships could also feed my mind with tales from the wide world. The world was a good deal larger at that time than it is now. Instead of flying around the globe in less than a week, it took them a year from England to China and back in 1858, and many exciting things happened in that time. As a result of my reading and the tales Father told, I acquired quite an extensive knowledge of what went on in the world. I was the oldest of three children. Lorentz was born in 1867, and Cornelius was born in 1872. Father felt that there wouldn't be any future for the three of us on the coast, so he decided to immigrate to the United States. We left Norway in 1882. We came first to Minneapolis, and a little later to Wilmar, Minnesota where an old friend lived. We took some land in the northern part of Kandiyohi County. In 1893 when my youngest brother was 21, we decided to look for homestead land. Providence leads us to Aitkin County where the family centre has been since. I was married in Chicago in 1903 to Caroline Hegna, who had come there two years before from Skien, Norway. She died in 1931 at an age of 61 years, leaving six children and myself to mourn her departure. My homestead, (the Bear Lake Farm, as we fondly call it) is located in Section 4 in Idun Township in the southern part of Aitkin County. The original homestead consisted of 151 acres, 9 acres of which is in the lake. Later I bought the fraction adjoining on the east, 31 acres in section 3, so the farm consists of 182 acres. At that time it was all solid timber. My farm lies on the southern side of the lake, and takes in half a mile of lakeshore. As there is a wide correction line in the government survey on the north side of the township, it explains how we could get four almost full homesteads besides the lake in one section. Maybe we realized after we got settled we had undertaken a job that would take long life time to accomplish, but we were young and had "crossed the river" so we had to go to it. First, we had to cut roads. The first two settlers in Idun Township, Hans Melsby and Peter Hagen, had cut in from John Skretting's place in Eastside Township, Mille Lacs County, two miles west, in 1891. The year after, Ingvald Melsby cut from the southwest part of section 6 to his claim in section 8. When we started in 1893, we started on the east line of section 8, and cut across section 5 and most of section 4 to Bear Lake. Those roads had a beginning and destination, but had no regard for straightness, or survey lines. We had to keep on high ground as much as possible, circle the swamps by long curves, and at times we would use an old beaver dam as a bridge, and the embankment as a roadbed. We also had to avoid all the larger trees as much as possible as everything had to be cut level with the ground. The road looked as if a hugh snake had crawled through the woods. When there had been a strong wind the road would be filled with windfalls, and it took hours to cut them out. We never left the place without a sharp axe in the wagon. The first house I built was logged of round tamarack logs, 12' x 16', and roofed with split poles with birch bark and mud on the top. I used it from the start as a blacksmith shop. I had learnt the trade in Norway and here in the wilderness it became a necessity. We needed sleds and various implements used in the woods, and also horseshoeing needed to be done. To comply with the Homestead law, I put a bed in one corner and slept there occasionally. Several years later in 1897, I set up a good log house of hewed pine logs. They were hewed to six inches and carefully grooved. The floor and ceiling were made from hand-sawn lumber and planed with a hand plane worked by two men straddling the board. The house is still standing there, sided and included in a frame house built years later. My father built himself a nice log house the same way. We roofed our buildings with split balsam poles, hewed and peeled and covered with birch bark, later replaced with shingles. We boys got quite used to building log houses and during an eight-year period built about 20 different buildings on our homesteads, and hardly a nail was used in their construction. Father who was too old to partake in all the hard outside work, but was an expert in carpentry and woodcarving, busied himself with filling up our houses with homemade furniture, chairs, bureaus, bookcases, bedsteads, tables, etc. It was many years before we spent any money on new furniture, and some of the old furniture is still in use. As to farming conditions, we came from prairie country, and we did run up against snag. We had counted on being able to grub out at least enough land for potatoes and other crops, but we found the roots of the forest too hard to contend with that we had to plant our potatoes the primitive way that evidently the Pilgrims used. We cut a little hole in the ground, dropped a seed in, and then put loose leaf mold on top of the seed. It was a lot of work, but between us we managed to raise 100 bushels the first season in 1895. We cut hay with scythes for several years. The first year we found hay out by Mille Lacs, but later we found good hay meadows just west and south of the present village of McGrath. This again involved cutting several miles of road. My brother had slashed down a few acres of timber and the next spring he started to burn and clear it. The fire began spread rapidly over the entire slashing. When we finally got it under control, the burned-over piece looked so inviting for a seedbed that we all went to work and skidded everything out, and seeded oats. Then we hitched a horse to a big balsam top and in that way got the ground harrowed between the stumps. We raised 300 bushels of oats on that land that year. It was harvested with a cradle. Our neighbors used the same methods. Several years went by before we could get decent plowland. It was not until after we got stump-pullers and dynamite, that plowland began to increase in any marked degree. I read once in a book on pioneer life that it took twenty-five years to develop a farm in the timber, while it took ten years in the open areas. I can testify to the truth of that. As far as schools were concerned, the first few years there were only two or three children of school age in the settlement, and they could go to the school over at Opstead, about two or three miles west. I believe it was in 1896 when the county school board appropriated $50.00 for two months school, and as Ingvald Melsby had built a nice new cabin on his claim at Cedar Lake he let the district have the use of it for a schoolhouse that winter. Berentina Anderson, now Mrs. Peter Sehlin, who lived with her father on a claim just over the country line, got a permit to teach and received $25.00 a month for the two months. In 1897, (I forget the precise date) we organized the school district. We proposed to build two schoolhouses as several families had moved further east, one on the south line of section 5, and another on the east line of section 10. We decided to build of hewn pine logs as the cheapest way. Each settler was to donate a few good-sized logs. I think the inside was originally 16' x 20'. Later on entry of frame was added to it. The contract for the logging was awarded to Reiar Bakke, George Arneson and Knut Olson for the sum of $125.00 for the two buildings. Lumber could now be gotten from the not too distant sawmills, and used for a town hall. The children are now transported by bus to the McGrath Consolidated School. I cannot recall the exact date, as I have not all my files at hand, but about 1896 we began to talk about the advisability of organizing the township, so we could get our own funds for roads and public improvements. We called a public meeting and made an application to the county board for organization. We all agreed on that. Then there arose a lively debate about a name for the township. All the settlers at that time were Scandinavians, so we wanted a name to remind us about that fact. It had lasted awhile when I suggested that we call it "Idun." That name was pure Scandinavian and should satisfy both Swedes and Norwegians. Everyone turned on with me " what does it mean?" I explained that before the gospel of the white Christ, as He was called, our forefathers in those, northern countries worshipped some deities they called Asirs. They dwelled at a place they named Asgard (or heaven). There were many of them and one had a daughter he called Idun. The gods gave her great gifts on her birthday. Some gave her beauty, some charm and wisdom, and one brought her a basket of golden apples which had the virtue to give to those who ate them youth and strength, no matter how old and feeble they might be. So the name stands for youth and beauty, and there is nothing we need so badly here as an Idun. (We were nearly all bachelors). Everyone started to laugh and the vote was solid for Idun. In a book printed several years ago by the State Historical Library, St. Paul, Minnesota about places in Minnesota and their name, I found the following statement: "Idun township, Aitkin County, Minnesota. Named after a village in Sweden." I called the librarian's attention to it. He said there was to be a revision of the book as they had found a lot of incorrect statements in it. I told him my tale, which he noted. The village in Sweden is Idunar. Both names have the same origin but otherwise nothing in common. He told me there was a plan in view to correct these statements, but that it would be a delicate job. The Second World War started just then, and Arthur Larsen enlisted and I never heard any more about it. Now something about our mail service. John Skretting arrived in the fall of 1887 from South Dakota and took a claim a quarter of a mile east of the present Opstead store in Mills Lacs County. He was a rather enterprising man and the first of those who came from South Dakota. He found quite a good-sized space in the woods so it did not take him long to get a piece of plowland ready. 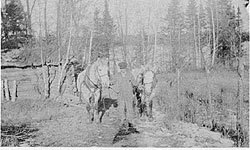 As there were few roads, nearly all traffic was carried on in the wintertime on sleds as the logging concerns had to get supplies up from Mora to their various camps. The nearest mail service was somewhere north in the Malmo settlement, twelve or more miles away. Mr. Skretting got up a petition to have that route extended to his place. The petition was granted with this condition, that someone had to haul the mail from the nearest station six months for nothing, and as no one was able or willing to take that burden and Mr. Skretting the only man in the settlement who had horses, he took the task himself. He was allowed to get the mail in from Mora and use the winter season as the tote-roads were open then, and he only had to go once a month. The trip took two long days and sometimes more. He did some hauling for the neighbors and picked up mail from the camps and people along the road as he got stamps from the government and could cancel them. The post office was named Opstead after the Dalcarl settlement through their leader Elg Peterson had received a little money from Aitkin County and cut a road northward from this settlement (the present Eastwood) to the road at the north end of Mille Lacs Lake. As an old timer told me once, "we each took a sack of provisions on our backs, cut road all day and when night came, we cooked the kettle and rolled up in a blanket and bedded down under a tree, and then cut further the next day." It, like all the old trails, was crooked and went around all the swamps and low places, but a few log bridges were put over the worst places. In the spring of 1892 a stage route that made two trips a week between Aitkin and Opstead was opened. Some years later it connected with the mail coming up from Mora to Isle Harbour and made three trips a week. This continued until the railroad came in 1910, but most of us had to go from five to ten miles to get our mail. A little after the turn of the century a mail route was opened up from Opstead to Section six, town of Williams, by a homesteader, Charles Lindberg. Hans Ruud, the mail carrier, carried the mail on his back. The post office was named Elmwood, and if someone looks at a Minnesota map from 1906 he will find it marked about a mile southwest of the present village of McGrath. If you were to go to the place now, all you would find would be the cellar of the house and the wilderness around it. I will close this first part of my pioneer story. I have, at different times, written articles, which have been printed by the Minnesota Norwegian Press. If you would be interested in them, please let me know.